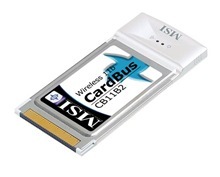 The MSI CB11B2 delivers up to 11Mbps transmission data rate in the 2.4GHz frequency. It works withIEEE 802.11bcompliant devices and is capable of handling data-incentive applications including real-time MPEG video streaming. In addition, the CB11B2 comes equipped with the ability to help prevent access to sensitive data on the network to secure over the air transmissions with 64/128-bit WEPand IEEE 802.11i TKIP encryption.